No, Mikey, are you kidding? ... now, can I have a bite? 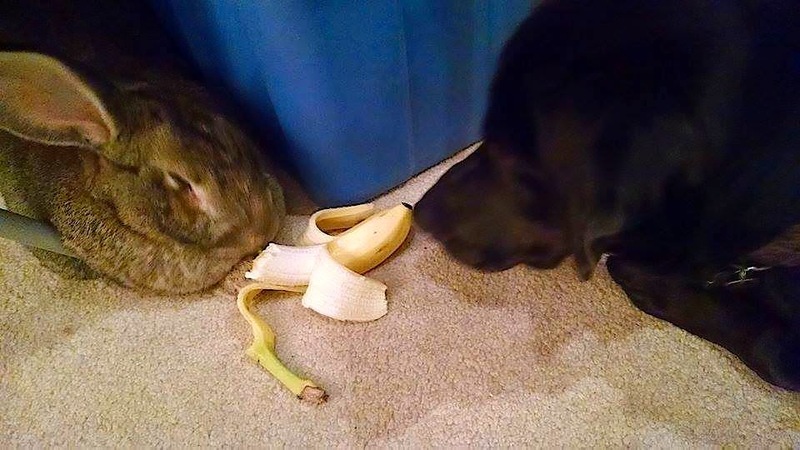 A black lab is the clutches of a designing rabbit . . . what a heart breaker. ... and over a doopid banana at that. What a lucky dog to have such a fine rabbit to serve. Jen, I am sure you are right about dogs being smarter. It's just undeniable. We owe almost everything to the our symbiotic relationships with pooches, and we are not very grateful. All I am saying is someone throw that dog a banana, please.